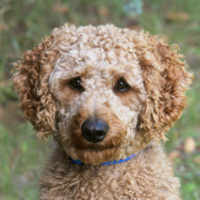 F1B medium/large Goldendoodle pups from our soft-tempered and willing-to-please 65 lb F1 Goldendoodle dam and our snuggly, moyen, apricot poodle sire. Click on the photos above to find out more about the proud parents. 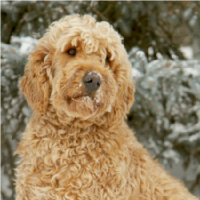 Hazel and Swede are very proud to announce the arrival of their fabulous medium and dark apricot F1B medium goldendoodles! 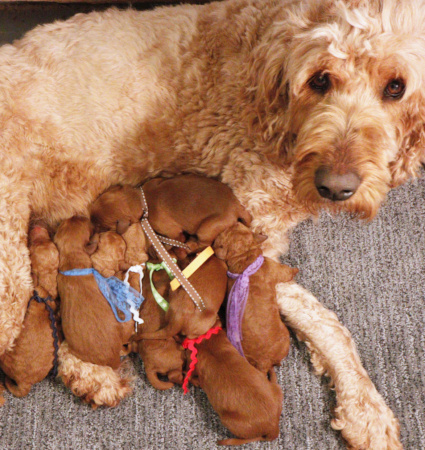 At 7:45am on Sunday morning, and exactly 1 week after Kit had her litter, Hazel started to have her pups! She had lots of false labour last week and finally it was her turn! She was a pro!! There are 11 pups! The theme is Spring Flowers. The boys are: Crocus, Daffodil, Freesia, Hyacinth and Tulip. The girls are: Azalea, Bluebell, Iris, Lilac, Lily and Peony. All of her pups are so well cared for, as she's very gentle and attentive. If you look at Hazel's and Swede's first litter together, 2 years ago, there were only 3 pups who were very different from each other. I believe this litter will be much the same. Some are very curly and some quite straight -- and it looks as if there will be a vast range of sizes!! My guess is that the pups will range in weight between 35-60 lbs. Their vet check is on May 13 and choosing can start happening shortly after that. They'll be able to start going home after May 29. I have a few spots available in this litter. If you're interested, please contact me.